The city beautiful movement is spreading. In an effort to bring that movement onto the campus, this structure incorporates the necessary infrastructure of nightime lighting to the ability to foster a healthier community by planting flowers, not only improving air quality, but also literally creating a more beautiful campus. The flower intended for this project is the morning glory.This purple and yellow accented flower is known for its sensitivity to light. 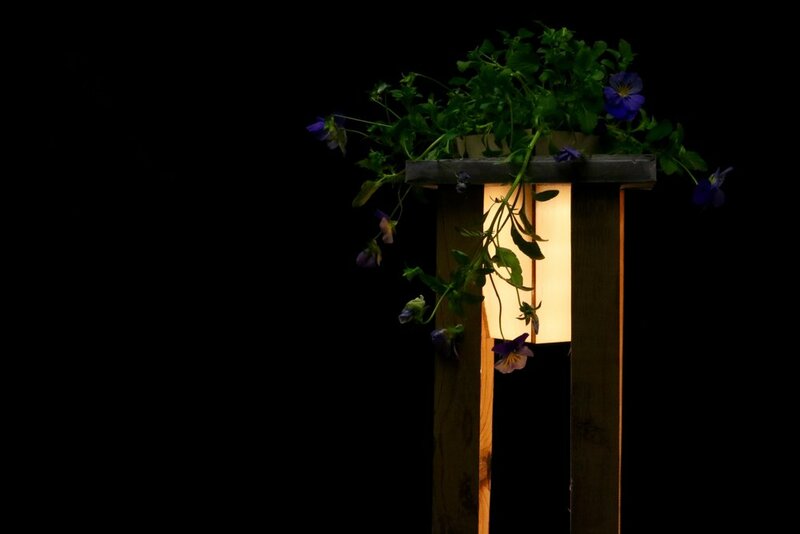 As it opens and closes throughout the course of the day, the flower would bloom a second time that day when the light from the light fixture reawakens its typical nighttime slumber. Furthermore the morning glory’s ability to climb would allow the flower to truly become a source of light reflectance in the plantern, which is key to reduce the degree of contrast. The materials selected for this light fixture are rough sawn Texas cedar and cast in place concrete. These two are both highly effective for the outdoors and sit together sumptuously. The wood stands tall and firm as the compressive structure, lifting the plant into the sky while the concrete serves as the tensile structure connecting the two and creating a role reversal. Additionally, all materials were locally sourced. This chart represents the lighting distribution when two leg lights are turned on, the expected position to avoid glare.